Are you a freelance writer? Want to build your online portfolio? want to increase your audience? This post is only for you. 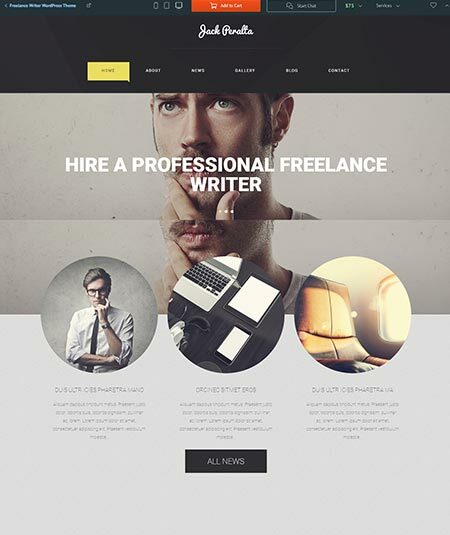 In this post we selected most popular and latest WordPress themes for freelance writers. Which you can take it today and start your online portfolio. Which will help you to get hired for more job and also build a strong presence online. Every theme is well researched and hand-picked items by our special team member. So you don’t have to think twice to buy any of them. Most of this theme has the powerful visual builder and user-friendly theme options which will help you to add and customize your website more easily. Also you can take a look some blogging WordPress themes which will help you to get some more idea. So, take a look step by step and choose the best one which is perfect for your topic. I hope this post will help you to find the best themes for your website. 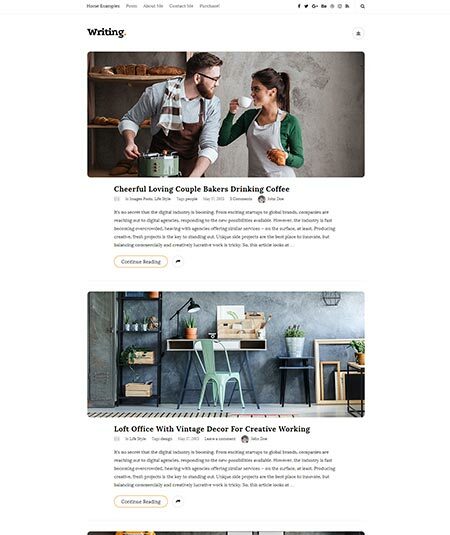 For the writers, who are eagerly in search of a good WordPress blog theme, RibTun is a great option as an authentic text-based WordPress theme that works even without an image. It helps to make one’s writing ability better by giving more emphasis on it. RibTun is SEO and performance optimized and has a smooth working ability on any device. Furthermore, it is built with a great readability feature that would never upset you. You are offered with four blog layouts with unlimited color options. Even this WordPress theme is featured with CSS3 and animations. Even the typography is well enough to impress you. You will get five blog post types like standard, gallery, video, audio, and Revolution slider post. Besides it requires six gallery types like full-width, boxed, Instagram feed, video, full-width 2 and lastly the boxed gallery 2. So I think this WordPress theme can get your attention with its impressive features. 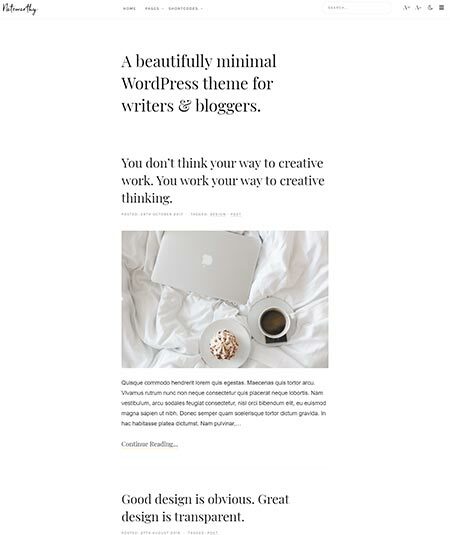 The Writer is an authentic premium WordPress blogging theme and is a good choice for them who are in need of one like this. It will provide you with numerous pretty themes that are easy to customize. This WordPress theme provides a very good readability with a mobile-friendly feature. The topography of this theme is perfectly set up and the search engine is well enough to blow your mind. For posting a different advertisement, video, and image in different social media, it is very comfortable and easy to use. Even to use this theme you don’t need to have extra mobile plugins. You are allowed to the customer the fonts, size, line heights and colors of it while using. Even you can upload your company logo through it. It is also featured with drag and drop page builder. What do you think about it then? I hope it will not disappoint you. 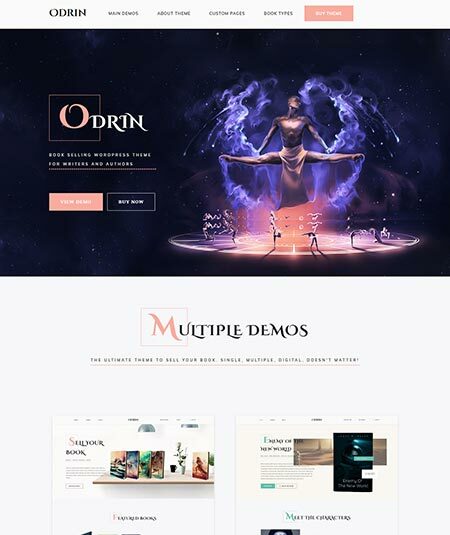 For the writers and book authors, Odrin as a modern and impressive WordPress theme is one of the best media to present their thoughts through a web book as it is featured with easy page flipping effect and responsiveness. WooCommerce support is available for you if you use this theme. You will also benefit from ten prebuild templates and shortcodes. Furthermore, a book timer is also set up for your comfort. You can also show the upcoming events about your books to your readers through this WordPress theme. It is again SEO optimization with full-width page option. Again tons of shortcodes are available here like blockquote, book image, list, recent and upcoming books, feature books etc shortcodes. Even you are offered free updates and 700+ google fonts. So this WordPress them can be a good option for you if you are an elegant author. Writers and Journalists Blog WordPress theme is such one that is well enough to impress anyone in accordance with the mentioned profession. It is much stylish and trendy as with lots of unique functions. This WordPress theme is featured with six blog style menu options with exclusive premade modules. Again it has completely WooCommerce capability with advanced contact forms. This theme is 100% Retina ready with lots of useful plugins like WPBakery, Page Builder, PO composer etc. Again this theme is very easy to install, use and update. You will be benefited with its mobile-friendly sliders and fully responsiveness. It offers you three different page layouts with translation options, powerful frameworks, tons of shortcodes and many other functions. I think, to grab this theme will be a great decision. 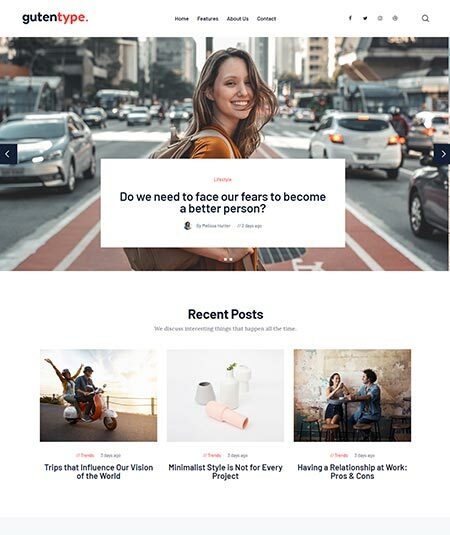 If you are a professional writer and are looking for a well-customized WordPress theme to publish your important thoughts, I am presenting Hooray for you. Hooray is designed with a powerful admin panel, RTL support and responsiveness to impress you. You will be happy to have six different blog layouts with three portfolio layouts as well as more than thirty custom widgets while using it. It has again SEO optimization and about forty shortcodes. Hooray is with free lifetime update and it is Retina ready as well as bbPress and BuddyPress ready. It offers you lots of options to set your icons, logo, and menu. Another awesome facility of it is its WooCommerce capability. Furthermore, it has unlimited sidebars and is built with mobile-friendly sliders. You will save 17$ by using it as of its sticky sidebar plugin. So I hope it will meet all your needs perfectly. In terms of professional writers and content marketing, Tabor is a name of a WordPress theme one must need to know. 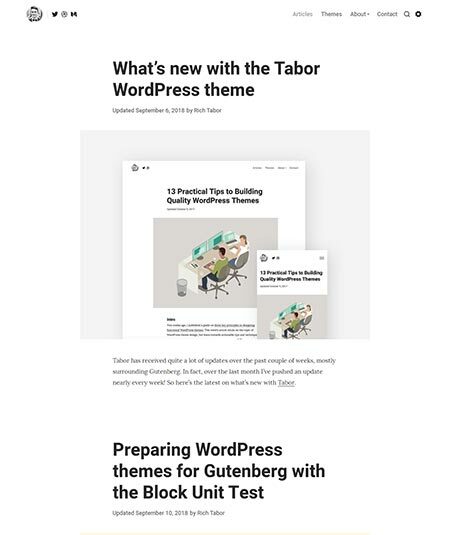 Tabor the first of all 100% Gutenberg WordPress theme that is presented with the full support of OptinMonster, Yoast, Schema etc. Tabor is great as a booster of your online presence and so, readers get it easy to find your page. Again tabor is built to run your WordPress design and development blog smoothly. Besides it is very easy to run an update. You will also become astonished to know that Tabor is very scalable, resource light and schema Markup Ready. Again Yabor is SEO optimized and super fast to use. Tabor is featured with high readability and monsterinsights support. To share something in different social media, it is very easy through Tabor. You are also offered localization support and MailChimp for WordPress support. I hope, all its features mesmerize you and so you will be satisfied with it. 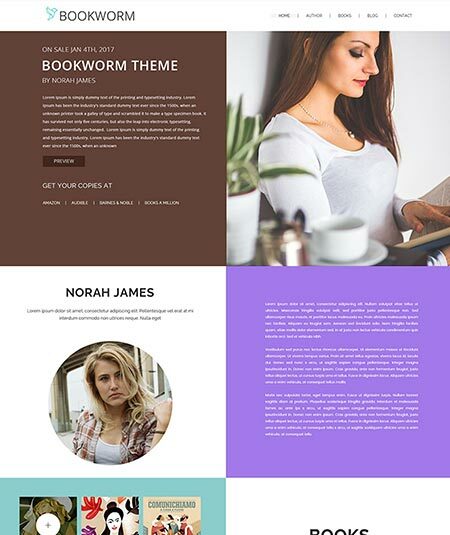 For the writers and bloggers, Noteworthy is an awesome minimal, content focus and responsive WordPress theme. It is very good to indicate reading progress and with special future-proof code. Noteworthy is presented with numerous stunning design. You will obviously get perfect ingredients to create your online presence. Besides it is SEO friendly that means you will get the search engine optimization too. Through this WordPress theme, you will be benefited with native WordPress live customizer and contrast readability mode with 404 custom page. Again the custom search page and custom sitemap template. Furthermore, Noteworthy is featured with automatic CSS combination and HTML minification. It is also designed to provide unlimited colors with lots of shortcodes and child theme capability. Translation mode and logo uploader are also here. So I think you don’t have any questions about its capabilities and I am pretty sure that you will love to use it. 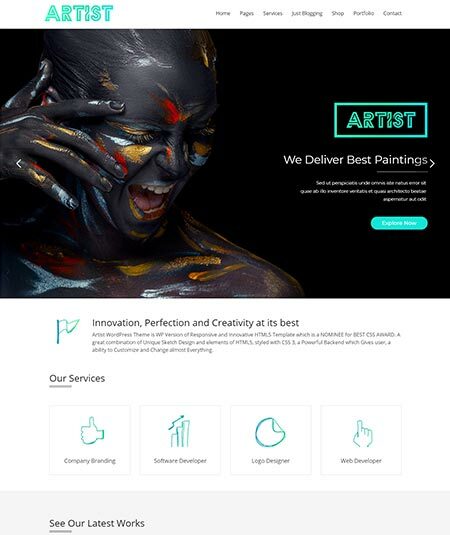 You know what the word “Artist” means but here artist is the name of an amazing WordPress theme that is a perfect option for the painters, handcraft writers, and pencil designers. You are allowed to present your talent for creating marvelous artwork through this WordPress theme. It is actually a multipurpose sketch layout WordPress theme that is fully responsive and compatible to all modern web browsers. Even as an artist, you can present your amazing pencil sketch. Artist will provide you a filterable portfolio as well as show them in different ways. You can also enjoy a free Sketch Font and the shortcode generator. Again Artist is very easy to customize and it is SEO optimized. You will be happy to know that HTML version is available here with the free professional support. Again WordPress 3.0+ is also ready to customize the images. The theme option is very simple because of its responsive design and grid system. You must be amazed by Artist’s features and functions. I hope it won’t be a cause of your dissatisfaction. 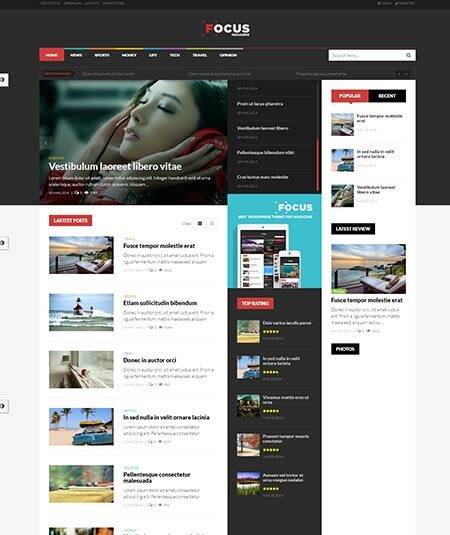 Focus, is the name of a good and responsive WordPress theme for the news and magazine bloggers. This theme is very creative, decent and easy to use type one with multiple homepage layouts. You can customize the color and skin with the mega menu system and the live theme editor. Even it also allows you to choose the view from a grid or a listed one. The Focus is compatible with WordPress 4.9.x with HTML5 and CSS3 support. Focus has lots of tutorial videos and a responsible supporting center. It always supports multiple post types and the additional custom Css and JS code. Again it is built with WPO Framework Version 1 and Bootstrap 3.0. Furthermore, Focus is featured with easy installation data sample and theme control module. Besides, it has valid XHTML and CSS markup. So it will help you to improve site performance. I think there should be no doubt about its stunning features and you won’t regret grabbing it. If you are looking for a clean and responsive news, magazine and blog WordPress theme, Notiz can be an eye-catching theme you may get. Blogs about traveling, photography, food and nutrition, sports, fashion etc are very suitable for this theme. Notiz is built with integrated Mega Menu Module as well as the Vertical Mega Menu Module. WordPress 4.9.z is approved for this theme and it is also compatible with 4.0+. HTML and CSS3 are also available here. You can customize your site with tons of features like WooCommerce options, Header section options, layouts settings, post list options etc. Besides, Notiz is fully mobile and touch in a friendly way with a great readability. Numerous background options are offered by Notiz with lots of vector icons for the readers’ perfect retina display. It also includes different module animation style and footer builder functions. It’s sidebar generator also let you create unlimited sidebars as you wish. So you can grab this WordPress theme with any questions. If your motive is to find out the best WordPress themes for writers, My Pen can be a member of your list. It is an exclusive bloggers theme that is 100% responsive so to you can use is through a desktop, laptop, tablets even through a smartphone. My pen is an SEO optimized theme and so you don’t need to be worried about the reader’s attention to your page. Again it is featured with the WooCommerce support so you can sell your goods and thoughts in the online markets. If you use this theme you will be benefited with lots of features like WPML, one-page support, tons of shortcodes, page options etc. You can also customize and edit your page as your own wish. Through My Pen, you can choose your font from more than eight hundred google fonts. Besides six hundred plus Google web fonts with topography are also available here. My Pen video tutorial and an extensive user guide will allow you to use it properly from the beginning. So I hope you don’t need to think twice about this WordPress theme. 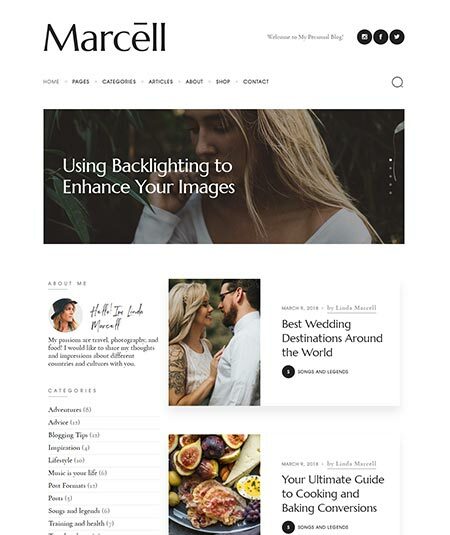 Marcell is an attractive and well responsive minimal blog WordPress theme. This theme is very good to present blogs, articles, stories, news, journal etc. As a professional and entertainment blog projects, Marcell has already gained a good name. About two very important facts, SEO optimization, and WooCommerce support, you don’t need to think at all if you choose this theme. It is 100% responsive and good to use through a smartphone. Even your page will catch the reader’s attention very easily through it. Marcell offers you a number of pre-built pages and templates with a powerful framework. One-click installation is available here as well as the essential plugins like MailChimp, Instagram feed etc. Lots of handy functions like pop up menu, top menu etc are offered by Marcell. Again tons of powerful ThemeREX Addons plugins are also available. It also allows you to build as many layouts as you wish. Marcell won’t disappoint you and so you can grab it as it is trustworthy. 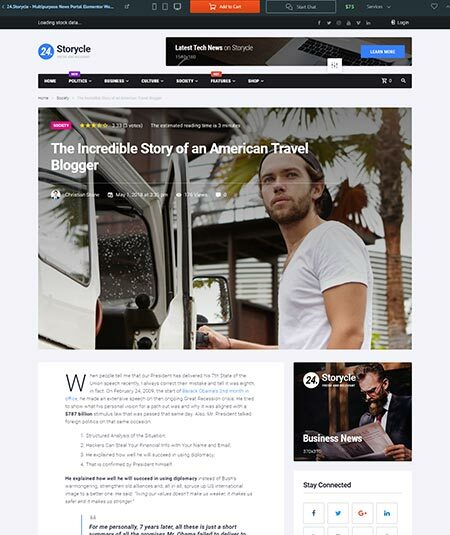 For the modern bloggers, Gutentype is a name of opportunity through which they can successfully present different types of blogs, rouge, giveaways, guides, news etc. It is a full Gutenberg supported blog theme. It is a 100% responsive and mobile friendly with more than 750 customizer options. This theme is designed for the best performance with lots of theme options panel. Gutentype is a premium WordPress product with the essential plugins like ThemeREX Addons, MailChimp, GDPR Framework, Instagram feed, and many others. Lots of Google fonts are also ready as the options. For this theme, WordPress 4.0+ is tested and it is with HTML5 and CSS3 code. Furthermore, it is compatible with mostly famous cross browsers like Firefox, Chrome, Safari etc. I hope Gutentype will meet almost all your needs. 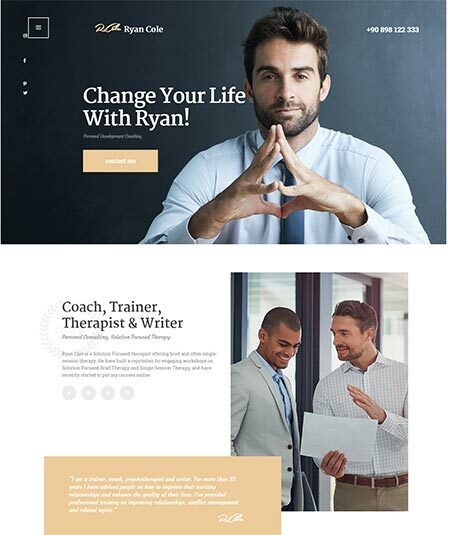 Some of the bloggers often feel the need of a life and business coaching WordPress theme and R.Cole is for them. R.Cole is in fact built for an impressive internet presentation by providing guidance about life and business. As well as the advantage of easily import demo just with a single click, Ryan Cole is also very friendly for the smartphone users. Drug and drop page builder of this theme will benefit you with lots of visual composer plugins. R.Cole is SEO optimized and so your page will easily catch the readers attention. Again it is very easy to install and use. Multi-layout pages with tons of shortcodes are waiting for your betterment. Cross browsers like Firefox Chrome Safari etc and WordPress 4.0+ are tested to check its compatibility and it passes. Flexible color and typography are also here for you. So you can customize the theme as you wish to. I hope you will be satisfied with R.Cole and of course, love it. 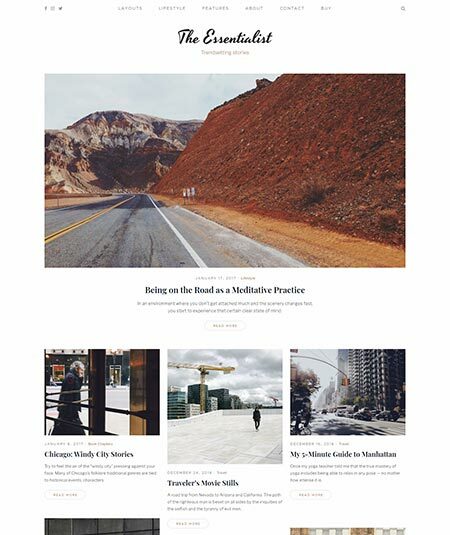 Among the best narrative WordPress themes, Essentialist is one. Essentialist is designed with a narrative style and authenticity. It is a very good source of photo blogging. Even a magazine, journal, and personal blog it works very well. This theme is developed with a smooth storytelling texture and a natural presentation of text, images, and videos. That means music blogs, art blogs, fashion blogs, photography blogs etc. can be its decent company. Essentialist is very easy to use as it is designed with the bloat-free experience. It is again fully responsive and mobile friendly. You can share the items of this theme through almost all social media as it has social media integration. You are offered full screen swipe-able picture gallery with the automatic native WP gallery. Besides, it is also Retina and translation ready. For its simplicity, all it’s users always appreciate it. So I think you don’t have any mistrust on Essentialist. With a classic and moderate design, Ebigale is presented for those who are eagerly trying to make their own blogs. 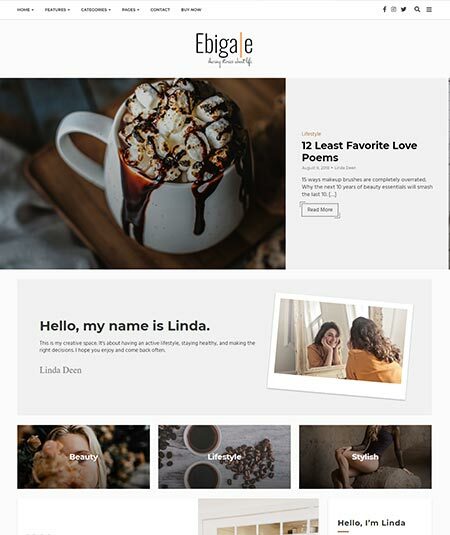 Ebigale is a four header type theme that is specially designed to present blogs on lifestyle, traveling, photography eye with images. As a well responsive theme blog, Ebigale allows you to use with any kind of well functional device with lots of pre-made demos and pages. It has WordPress customizer theme options with quick updating system. You are offered four sliders including Carousel and five homepages and archive layouts like default, list, mixed, masonry and grid. Three article layouts with three isolated columns are also available here. Efficient functions like drop-cap, scroll reveal effect, sticky header, Instagram feed etc are also parts of this theme blog. This one is also allowed you to customize it with unlimited color options, 600+ Google fonts and featured categories. Though it is not SEO optimized, you won’t lack any other advantages with this theme blog. For the writers, eagerly want to have personal blogs, Writing is now presented with its mesmerizing features. The most attractive feature of this theme is it’s simplest using and installing method. This is why 2500 users appreciate it. Writing is SEO optimized and so readers get it easy to find your blog. Again it is very readable and mobile friendly. So it is well responsive and Retina ready. Its clean typography must catch your eyes too. You are allowed to customize your blog with unlimited color options and multilingual and translation support. You will also get lots of options to show your contact through different blog styles. Writing is greatly engaged with almost all the social and so that you can share your content easily. Furthermore, more than twenty-four social icons, RTL language support, and cross browsers support are waiting for your betterment. So I think Writing doesn’t lack any of your expectations. 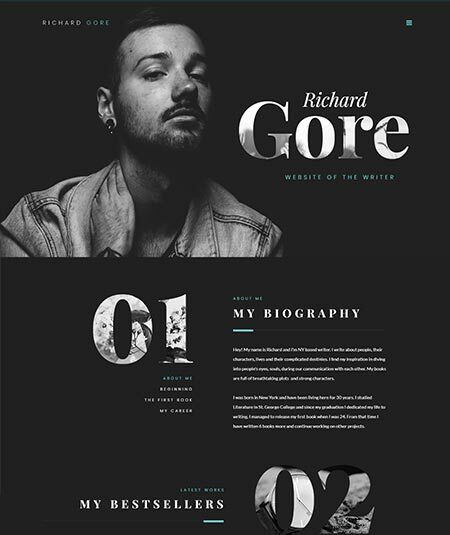 If you are interested in some writer portfolio element WordPress theme, Richard Gore is now presented for you. It is a magnificent and impressive writer portfolio element template. 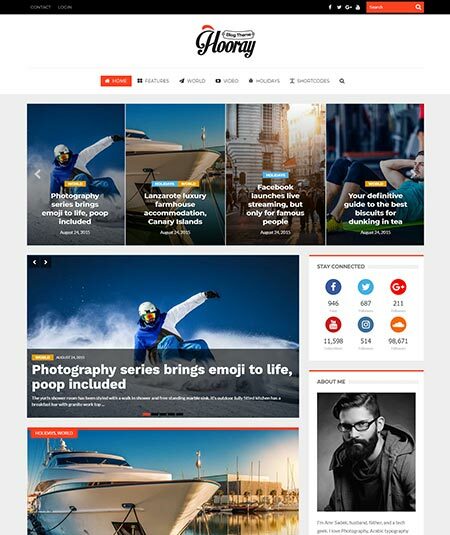 Richard Gore is a well responsive blog theme that let you use it through any kind of devices. Features like admin panel, easy installation, WPML, and retina support will be the cause of your coziness when to use this theme. Furthermore, the system always works to catch the attention of the readers as it is Search Engine in a friendly way. Again lots of sample data and guidance will help to use it properly from the beginning. In addition to the above features some more features are also available here like MailChimp, Favicon, live customizer, sidebar management, commenting system etc. Again it id performance optimized and cross browsers support. So I hope you will get all your demands by using Richard Gore. Are you looking for a good WordPress theme? If yes then Mafiaso is here for you as one of the best freelance writer. 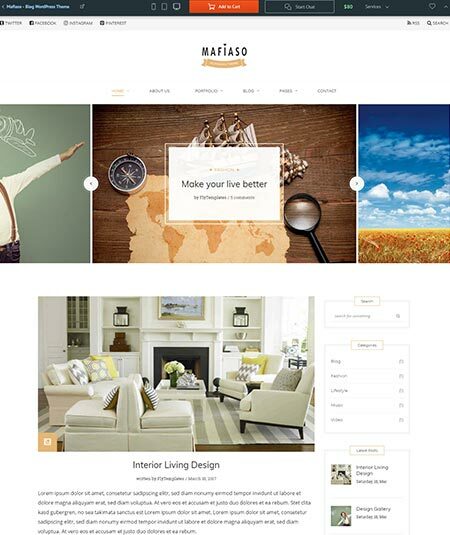 Mafiaso is also a decent choice for blog writers, recipe pages, interior design, architecture, fashion, business etc. Mafiaso is SEO optimized. So your blogs will always help you by collecting more readers. It is well response and Mobile friendly and this is why you can use it through any of your functional devices. You are allowed to upload video and image while using this theme blog. Again with numerous Google fonts and lots of color classification, you can customize your theme with your sweet will. The basic sets of elements and templates are offered with proper guidelines and sample data. So from the very beginning, you can use it smoothly. If your needs are enough with Mafiaso’s features, you can grab it without any doubt. 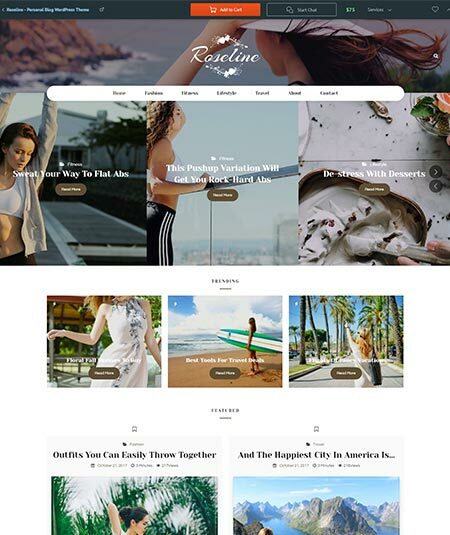 Roseline, a sweet name of a personal blog WordPress theme, can be a very decent choice for them who are in search of likely blog themes. Roseline helps you to be a successful blog writer by collecting more readers for your blog, presented nicely by itself. This blog theme is well responsive and mobile, tablet and desktop friendly. You will enjoy its simplicity with its one-minute easy installation and configuration process. Again one click demo and fastest updating system will also mesmerize you. About four blog layouts and post image header features are also available here. From 800+ Google fonts, you can choose any of your choices. You will also get the advantage of jetpack infinity scroll support and contact form support. This theme is also valid for HTML5 and CSSS3 and jQuery. Almost all the cross browsers like Chrome, Firefox, Safari, Opera, Android etc. browsers are supported by this theme. I think to grab this blog theme should have no obligation for you. If you are an author and are looking for a good blog theme for web publishing your writing then you will be happy to have NF Book Warm. Actually this blog theme is designed specifically for the authors and publishers. To make a showcase of your works and personal thoughts, it works as a fullscreen website. It is, in fact, a clear and responsive WordPress website. So with your any type well function device, you can run it. NF Book Warm has numerous Google fonts so that you can choose as you like also with unlimited color classifications. 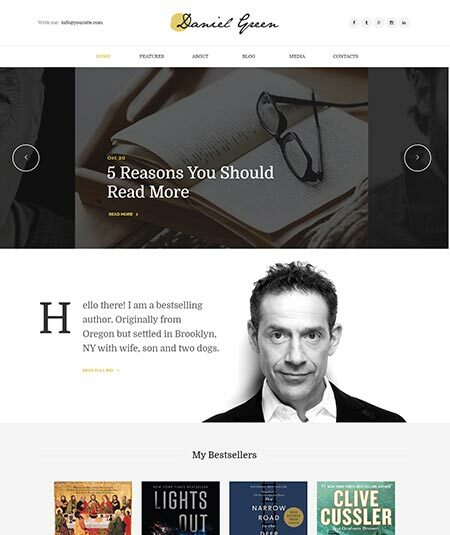 This theme is also designed to display the newly published and the upcoming books. 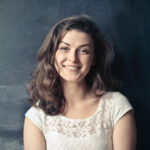 You will also get the opportunity to make the author’s profile, previously published book sections and the author’s blog while using NF Book Warm. It is also very easy to use, install and update. 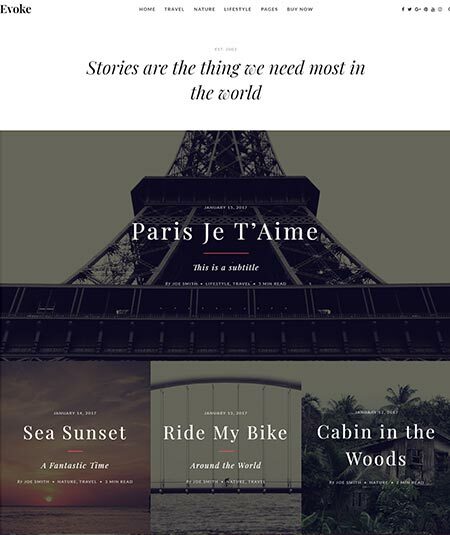 I am pretty sure that as an author you will obviously love this theme blog. Among the most efficient and best WordPress themes for a freelance writer, Jack Baker is a familiar one. 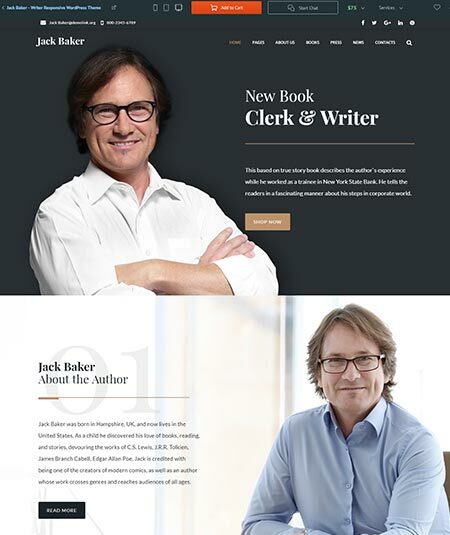 Jack Baker is a fully responsive theme with lots of Content modules and shortcodes. If you start using Jack Baker then you will able to enjoy some awesome features like Admin panels, Retina support, visual editor, WPML, drop-down menu and so on. With lots of pre-built pages and sample data, you can properly use the theme from the beginning. It is again easy to use and install and you can customize it with the element page builder and unlimited color options. Jack Baker is built with lots of cross browsers compatibility and friendly search engine system. It is also performance optimized with lots of social media connection. The sidebar manager is also available as a great support. These are the reason you can place your trust in the Jack Baker. 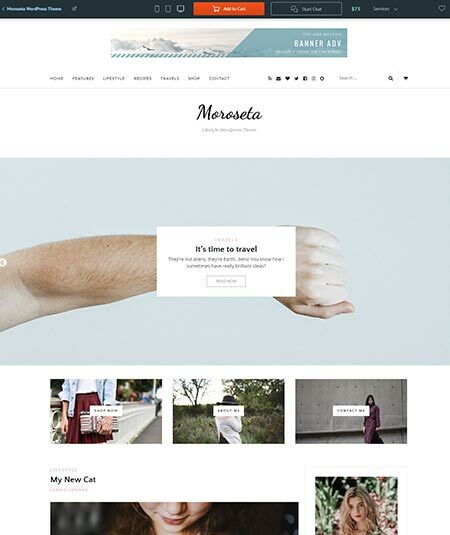 For them who are looking for a good minimalist blog WordPress, Moroseta can be a decent choice. 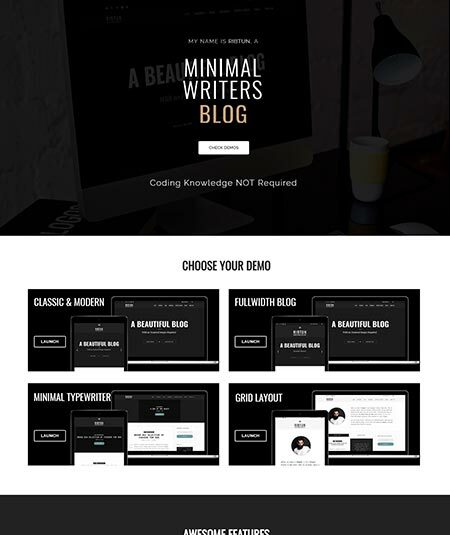 It is, in fact, a greatly refurbished minimalist blog theme with an array of features. Here, you will get about five different ready to use layouts along with four single post layouts. These will help you to create your own optimum structure. Moroseta is even presented with GPL license. Moroseta is featured with MailChimp plugins and right to left language support. It is again 100% responsive and mobile friendly. So can run this theme with any of your well functional devices. Along with the above stunning functions, Moroseta is also designed with Admin panels and extra pages layouts. Lots of sample databases are here to ensure the process of easy installation. So you can grab this theme page even without any doubt. As a journalist, you often feel the essence to have your own blog WordPress theme. If so, you may keep your trust on Editorso, a 100% GPL licensed WordPress theme that helps you to present your blogs easily. Editorso is a SEO friendly template and this is the reason you don’t need to worry about the reader’s attention on your theme. For being well responsive, you can also run this theme through your smartphone. Numerous array features are added to this theme which includes lots of layouts structure, widgets positioning, Google fonts etc. With the unlimited color options and page builder system, you can customize it as you want. This theme is very search engine friendly and lots of cross browsers compatible. Almost all the social media are well connected with this theme so that you can share your blogs through them. If you don’t think that it cannot meet all your demands, you can grub it. If as a freelance writer, you want to have a standard blog WordPress theme, Freelance writer WordPress theme is then for you. It is a very good option for you for the web publishing of your thoughts. it can assure you to make your theme page boost up and catch up the attention of the readers. This template is featured a full-width layout with impressive web design elements like large hero area, social sharing icons, full-width background etc. These layouts will help you to run it very fast. Furthermore, this blog theme has cross browsers compatibility with advanced theme options. Besides, it has Admin panels, bootstrap, WPML and lots of custom page templates. I hope this theme won’t be a cause of your dissatisfaction. Many of you sometimes feel the essence of having you on multipurpose News Portal Elementor WordPress theme. 24 Storycle is presented here for you. For all kind of news portal, it is a very good solution. This portal theme is built with powerful drag and drop and full responsiveness. So you can run this theme with any of your good quality devices. Eliminator page builder is also here as a great support. Besides, to sell your thought and product here is the WooCommerce facilities for you. Again 24 Storycle is featured with almost all the jet family plugins like jetBlog, jetTrick, jetMenu etc. You can customize your theme with unlimited color options and sidebars. It also has the AMP WordPress theme options like superb plugins and it is very easy to create custom headers. I hope you will be benefited with 24 Storycle. 4 News the name of quite a good WordPress theme especially for the news and magazine portal. It is a fully loaded theme with almost all types of news and magazine from all over the world. With power drag and drop Elementor page builder, you will get it easy to control and customize your theme. This theme includes almost all the Jet family plugins, like JetBlogs, JetReviews, JetMenu etc. It is also SEO friendly and so to make a boosted mood for your theme page you don’t need to work much. With lots of JetThemeCore, you can create your own headers, sections, footers etc easily. 4 News has well captivating and engaging Home Page as it is designed by high-class experts. Numerous layouts, sidebars, and shortcodes are also available to make it comfier. I think you can use these chance for your establishment. 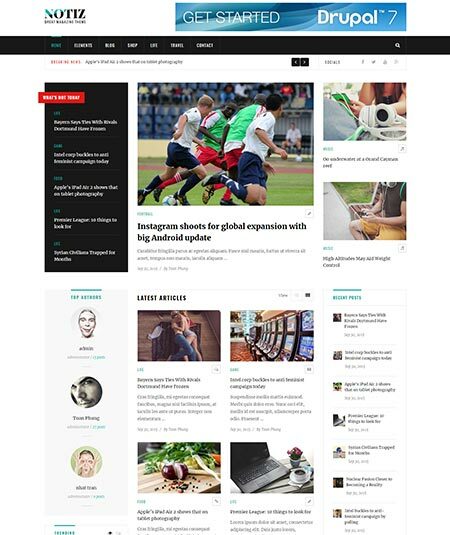 Let’s meet a world-class news portal Elementor WordPress theme, Publicon. It is in fact designed to use specifically as a great news portal theme with an array of latest features. All the plugins of Jet family are available here. Like the jetBlog which will help you to add site logo, login form, registration form, search and many others. So things come very easily and quickly. Aging you can adjust your theme with many attractive features like the smart list, smart tiles, text ticker, video playlist etc. Therefore, lots of layouts, sidebars and shortcodes are adjacent to it as for your good. You can again customize your theme with the parallax effect with JetTricks. Again you can attach your important content with “Sticky” widget. So you can highlight them as well as the most relevant news too. 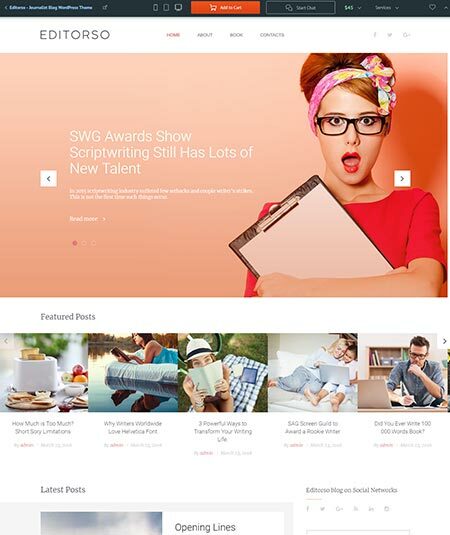 Don’t miss this opportunity to have such a decent WordPress theme. To get a relevant theme page on news and magazine portal, Has news is here to help you. 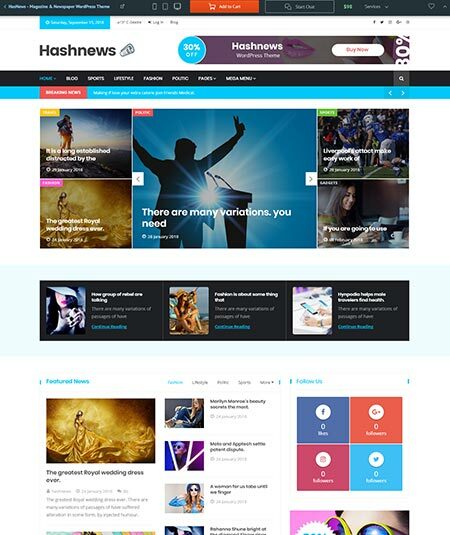 Hasnews is specially designed for publishing news, magazine, and journal of any kinds. Let’s meet the features of Hasnews. Hasnews is built with the drag and drop page builder. It is again fully responsive and retina ready. So to use it with your smartphone, you won’t get any problem. This theme includes more than three different home pages and 40+ KingComposer addons along with 20+ Hashnews addons. A well customized mega menu is also available here. You will get more than five different types of layouts with numerous color options. Hundred od Google fonts are also here as the options. Again it has cross browsers compatibility and easy to use element. So you don’t need to think further when to grab this theme. If you want to have a sports-related WordPress themes, you can try Sportex. 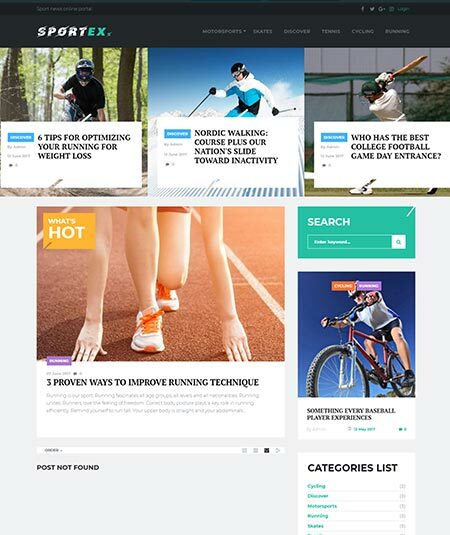 It is a fully responsive sports related WordPress theme. If you don’t have a desktop, its okay to run this theme through your smartphone. Sportex is compatible with all most all the cross browsers like Firefox, Chrome, Safari, Opera etc. The connection is so good that you can easily share your blogs through them. You can customize your theme with numerous color options, Google fonts, and stunning layouts. Again lots of homepage layouts, shortcodes and sidebars are also available. With lots of sample data, you will get it easy to use and install the theme. Again many eye-catching features like Admin panels, retina support, search engine optimization, social media optimization etc are also available in Sportex. So I think Sportex won’t be the cause of your dissatisfaction. NEWSmaker can be a good source of your blogs related to News and Magazine. 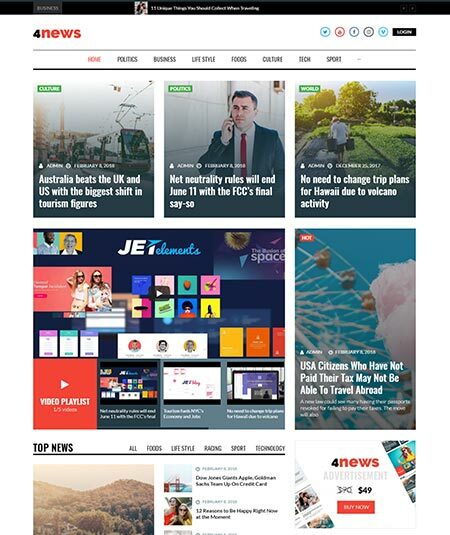 It is, in fact, a fully responsive News and Magazine portal WordPress theme and it is designed with many exclusive features. 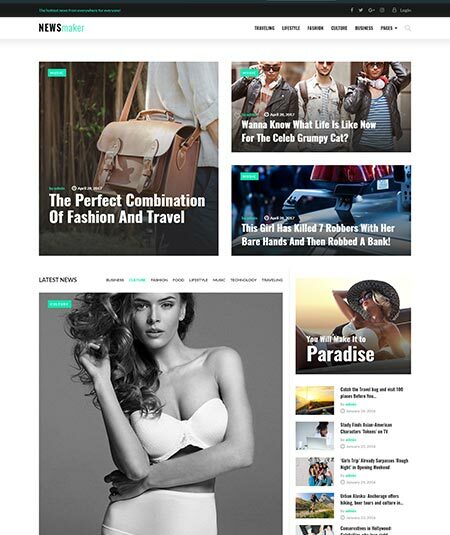 To create a popular online news medium, I think, you will get it tough to find such detailed WordPress theme. It is compatible with almost all the cross browsers like Firefox, Chrome, Safari etc. NEWSmaker is featured with easy to use and installation system and you can edit with hundreds of Google fonts and stunning layouts. Again you will get the more layouts, sidebars, and shortcodes that you desire. Furthermore, NEWSmaker has also Admin panels and search engine optimized. Enough social media optimization is also available as well as lots of jet family plugins. Besides, it is fully responsive with retina support. So I think you don’t need to be worried to grab this theme. 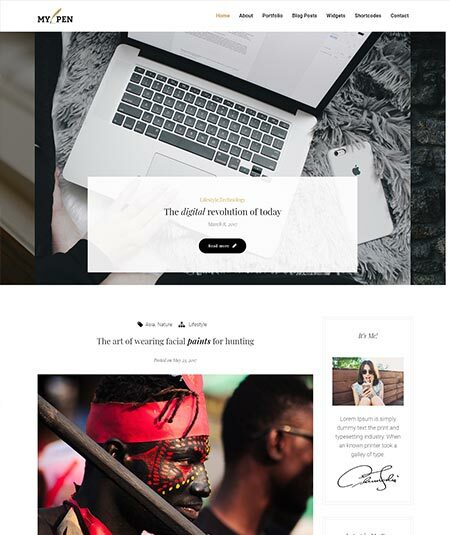 Some of you often feel the need to have your personal blog WordPress theme where you can publish and present your stories and blogs about fashion, lifestyle, food etc, you can then get a good one, Evoke. Evoke is compatible with Gutenberg WordPress editor and easy one-click demo installation option. It is again 100% responsive and mobile friendly. You can so use it properly with your smartphone. It will offer you about ten homepage layouts with archives and search page. Unlimited color options and Google fonts are also available so that you can customize and edit your theme as you wish. Evoke is also localization supported and XML Demo Data Included with almost all the social media icons. It is again SEO optimized so your theme will always catch the readers attention very quickly. What do you think about this theme? I hope it will be a great one. 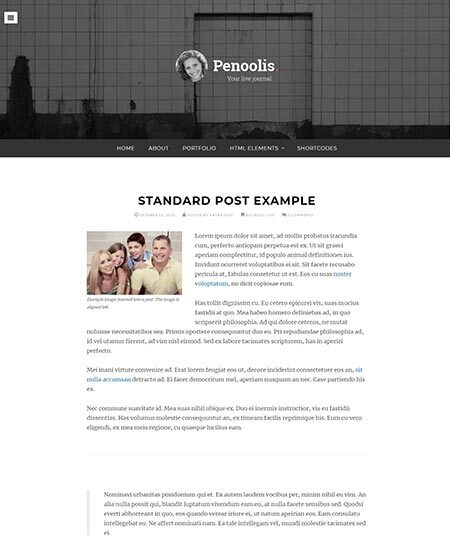 Penoolis is one of the best WordPress themes for freelance writers, especially who are trying to post their personal blogs and thoughts. It is designed with powerful theme options and features. While using Penoolis, you are allowed to change the color from the unlimited color options and the fonts from hundreds of Google fonts and typography. You are also allowed to upload your own custom logo and header and footer background. Besides, you can also use the Share buttons in the post detail pages with numerous social media icons. Penoolis also includes archives and portfolio page template along with the image attachment page template. AJAX pagination and google analytics integration are also available here. At the end, I have to say that penoolist must be a good WordPress theme. Bazinga is an authentic and trendy WordPress theme specially designed for crash-test dummy, guest post, rouge, business blogs, giver, giveaways, guide and how-to blogs, homer etc. It is a fully responsive and mobile friendly theme. It has more than 20 animation pages and about 750 customizer options. You will also get unlimited color options and Google fonts. It has the capability of almost all the cross browsers like Firefox, Chrome, Safari, Opera etc. Again it is a user menu and the Main menu supported. It also includes HMLT and CSSS3. Bazinga is also built for the best performances with the custom widget and sidebars. It is also with WooCommerce capability. So you can sell your products through the online markets. 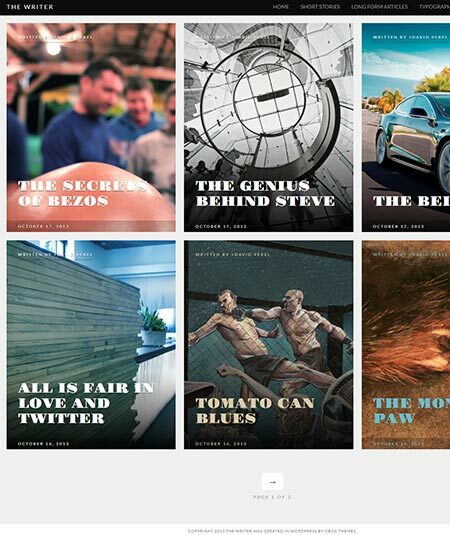 I think Bazinga has no lacking to be one of the best WordPress themes for freelance writer. 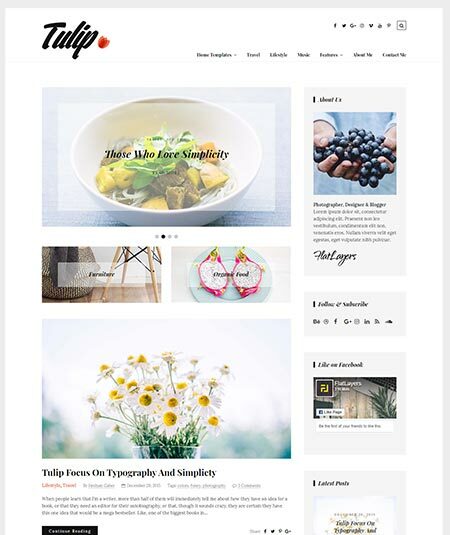 If you are in search of a good and responsive WordPress theme, then Tulip is not presented for you. It is fully responsive and particularly known for its numerous high-quality features. It has about 12 blog layouts and 9 original custom widgets. You will also get about 5 post formats like a gallery, standard, images, audio, and video. It is again very easy to use and install. WordPress customizers of Tulip will always allow you to add your logo, favicon, CSSS3, header and footer, background pictures, color and others with the help of more than 600 Google fonts and unlimited color options. Tulip includes about three banner sections and almost all the social media icons as it is cross browsers capabilities. Theme customizers and author box support are also available here with lots of sidebars. So there should be no doubt about the authenticity of Tulip. If you have any questions or if you need any more help from our expert team then feel free to comments below. We will try our best to help you and find the best solution for you. Also, if you know any best freelance wiritng WordPress template which we didn’t add in this post then feel free to let us know. So that we can take a look and include in this post.